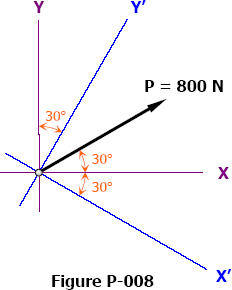 A force P = 800 N is shown in Fig. P-008. Find the y-component of P with respect to x and y axis. Find the y'-component of P with respect to x' and y' axis. Find the y-component of P with respect to x' and y axis. Find the y'-component of P with respect to x and y' axis.